He was an institution. There was not a single branch of Indian philosophy which he had not fully mastered. He was equally at home in Vedanta, Nyaya, Vaisesika, Sankhya-yoga, Buddhism, Jainism, Saivagama, Vaishnavagama etc. and the Tantras. He had also a thorough knowledge of Sufism and Christian mysticism. Gopinath Kaviraj, in his later years, became an ardent devotee of Sri Anandmayi Ma whom he considered goddess incarnate! Mahamahopadhyaya Gopinath Kaviraj, who was destined to be the leading figure in the field of Indological studies and the spiritual quest of man, brought glory to Varanasi, the age old seat of traditional Sanskrit learning. He came to this city as a student to Dr. Arthur Venis, the illustrious Principal of the Govt. Sanskrit College, in 1910 at the age of 23 years. Since then till his death on 12th June, 1976, he maintained and upheld the noblest tradition of Sanskrit scholarship marked by selfless dissemination of knowledge. Gopinath Kaviraj was born of a Brahmana family on 7th September, 1887 in the village Dhamrai in the district of Dacca of East Bengal, now Bangladesh. His father died a premature death while studying in the M. A. classes at the University of Calcutta, five months before the birth of his only child .As a result, the posthumus child, named Gopinath after the family deity, was brought up in the care of, a relation in another village. Gopinath had his primary education up to the sixth standard in schools at Dhamrai and Kanthalia villages wherefrom he went to the city of Dacca and joined the Jubilee School. He studied there from the seventh to the tenth standard and passed the Entrance examination in the first division from the University of Calcutta in 1905 at the age of 18. By this time, Gopinath fell a victim to malaria and had to take a year’s leave from regular academic life. In 1906, the young man set out for Jaipur, a city totally unknown and removed from his native place by nearly 1500 kilometres. Gopinath almost immediately drew the appreciative attention of’ his teachers by his wide range of study and singular devotion. Here, he studied for four years and passed the B. A. examination in 1910 in the first class from the University of Allahabad to which Jaipur was affiliated. Jaipur provided great scope to the young inquirer to quench his thirst for knowledge. He was already introspective and a voracious reader. While in Dacca, he took to composing poems which though lacking maturity, were nonetheless expressive of this philosophic bent of mind. At Jaipur he found greater scope for reading in the rich library of the Maharaja. His favourite subjects were literature and mysticism. He studied almost all available works on mysticism and occultism along with the classics—Greek, French, German, Italian and Spanish, in translation. Gopinath was a serious student and believed in thoroughness. He would take notes and never permit anything to be forgotten. He trained his memory in such a way that he could always refer to all books read by him. His interest in philosophy took a definite shape at Jaipur which thus played a very important role in his life. The final phase of Gopinath’s education started at Varanasi. The young graduate came to this city in 1910 and took his residence at the locality named Devnathpura to start his post-graduate studies. He passed the M.A. examination from the University of Allahabad in 1914, standing first in order of merit in the first class. Gopinath was then appointed Librarian of the newly founded manuscripts library of the Govt. Sanskrit College, Saraswati Bhavan and started his career of research. The University of Allahabad opened a new Department of Post-vedic studies under the headship of Dr. Venis. The classes of this department used to be held at Varanasi. Gopinath was also appointed in the Department and engaged in tutorial and lecture classes for the post-graduate students in the Saraswati Bhavan. He served the Saraswati Bhavan as Librarian for six years (1914-1920) and then was appointed Principal of the College. The first unsought honour came to him in 1934 when the Government of India conferred upon him the title of Mahamahopadhyaya in recognition of his valuable service in the field of traditional Sanskrit Scholarship. After serving the institution as Principal for 17 years, Gopinath voluntarily retired from service in 1937. As Librarian of the Saraswati Bhavan, he introduced two series of publications which show his far sight and interest in Sanskritic research. His entire attention by now became steadily concentrated upon philosophy in general and obscure schools such as Yoga, Saiva philosophy and Tantra in particular. At the same time, he started contacting the sãdhakas and yogis in his quest for the practical aspect of the different esoteric ways of sadhanã. The stages of the development of his personality may be pointed out thus—a keen researcher, a greatly gifted academician, a devoted seeker of Truth and ultimately a spiritual guide. Along with this academic work, Gopinath was advancing on the way to spiritual realisation. He started searching for a spiritual guide, the Guru. His search for the Guru found consummation in 1918 when he met Swami Vishuddhananda Paramahansa at whose feet he dedicated himself as a disciple. Since then he devoted himself to esoteric sãdhanã. Unlike his Guru who used to demonstrate supernormal powers, Gopinath never aspired to show yogic powers although he had full faith in the doctrine of yogic powers (siddhis). That his sadhanã was successful could be felt by coming close to him. Here was a man endowed with mastery over so many branches of learning but without the least trace of egotism or pedantry. The strongest adherent to his own discipline, he had no sectarian bias and firmly believed in the truth that all the different paths lead to the same realisation of the ultimate Reality. His basic faith in spirituality as the essence of human life gave him an inimitable childlike simplicity that was quite baffling in relation to such an accomplished scholar. He was optimistic in faith and synthethic in approach. His vast range of study led him to an eminence where sectarian distinctions naturally wither away. That is why he could so easily maintain his views without coming into conflict with the orthodox schools, the Buddhists, the Jains, the Christians or even the viewpoint of Islam. 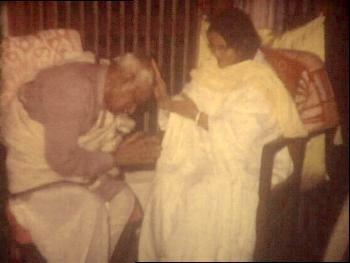 Gopinath~ came into personal contact with Mata Anandamayi in 1928. 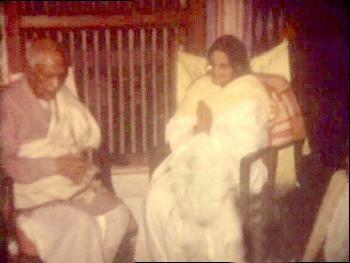 Both realised the worth of the other and the contact continued until his end came in the Ashrama of Anandamayi Ma. In addition, he had personal contact with many well-known sãdhakas of whom Ram Thakur, Meher Baba —the Parsee saint – Sitaram Das Omkarnath, Swami Paramananda Tirtha may be mentioned. Bharataratna Bhagavan Das also had impressed him, whose work on Theosophy drew his attention to that discipline. Dilip Kumar Roy, the well-known singer-disciple of Sri Aurobindo also had a personal relationship with Gopinath and some important letters were exchanged between them. In 1937, Gopinath voluntarily retired from government service. This year was important in his life as in that very year his Guru Swami Vishuddhananda breathed his last. Though all the disciples of the Guru wanted to put the mantle of the Guru on him, Gopinath resisted this attempt. He, however, took upon himself the responsibility to look after the Varanasi Ashram of his Guru. The retirement from service, for Gopinath, did not mean a retired life. He became the more active in matters academic and spiritual. He continued to remain the fountainhead of inspiration for the researchers who flocked to him for guidance and insight. In addition to guiding research scholars Gopinath held classes at his house and taught the texts particularly on Yoga, Saivism and Tantra. Along with all these activities, Gopinath must have been proceeding on with his personal spiritual sadhana which was never made public. He was quiet about personal achievement which, however, was apparent on his shining face and the endless compassion in his eyes. By 1960, Gopinath fell seriously ill. Medical examination detected a cancerous growth in the rectal region and he was taken to the Tata Institute of Bombay for treatment. In 1961 he was operated upon by Dr. Burgess of the Tata Institute. The late Sri Prakash, the then Governor of Maharashtra personally looked after his treatment at the hospital. The operation was successful and Gopinath returned to Varanasi where he convalesced at the Anandamayi Ashram. In 1964, the Govt. of U. P. decided to offer him the headship of the newly started Yoga-Tantra Department at the Varanaseya Sanskrit Visvavidyalaya. Gopinath agreed and worked as the Head of the department from 1964 to 1969. Gopinath had been severely shaken by the attack of cancer and his health was gradually deteriorating. As a result he relinquished the responsibility of the Yoga-Tantra department in 1969 and was prevailed upon by Ma Anandamayi to shift to Her Ashram on the bank of the Ganges at Bhadaini locality. Gopinath submitted to the wishes of the Mother and became an inmate of the Ashram. Here in this Ashram, he lived for nearly seven years 1969-76) under the personal care and supervision of Ma Anandamayi. Twice he had to be hospitalised at the B. H. U. and since then was kept under constant medical care. His daughter and devotees always kept a watch over him. It was at this Ashram that the end finally came. The personal life of the great scholar was as simple and unostentatious as his public life. He was married early, at the age of thirteen, in 1900 to Kusum Kumari, also of a well-known family of Sanskrit scholars of East Bengal. He had two children—a son, Jitendranath and a daughter Sudha. Gopinath lived in rented h9uses until in 1937 he shifted to his own newly built house at Sigra. Gopinath outlived his only son (a sad premature death) and wife and left behind him his widowed daughter, a grandson and two grand-daughters. Though a family-man, Gopinath lived the life of a saint and inspite of bearing all responsibilities incidental to family life was never ruffled in the face of calamities. True to the ideal preached by the Mahãbhãrata, he accepted both adversity and prosperity with complete equanimity. His firm faith in divine dispensation never flagged. He was one of the greatest personalities in the field of Indological studies, and from early on recognised the true greatness of Ma Anandamayi, under whose protection he spent the latter part of his life. 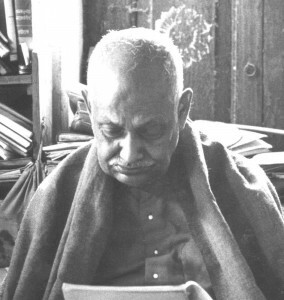 He was editor of “Ananda Varta” (quaterly journal) for 24 years, from 1968 till his death on June 12, 1978.